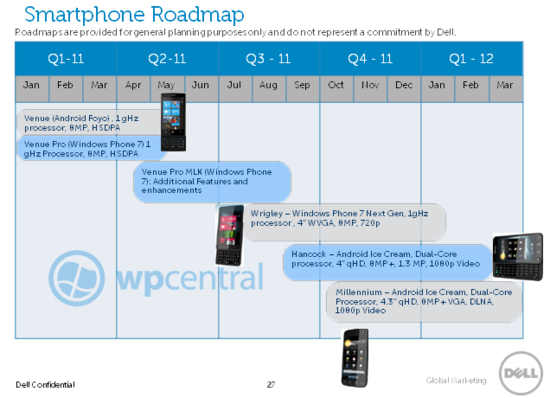 Dell, fresh off their stellar Venue Pro launch, have plans to release a new Windows Phone 7 device in Q3. The Dell Wrigley is touted as a “Windows Phone 7 Next Gen with a 1 Ghz processor, 4″ WVGA, 8 megapixel camera and the capability to shoot 720p video. By the looks of the spec sheet, it will be a portrait slider similar to the Dell Venue. Let’s hope for a smoother launch and can we have these things in stores. Nothing like a trip to a brick and mortar to check out the latest phones.